Although six months late, here is a brief post to introduce a new(ish) book I am both excited and proud to be a part of: Hanna Hodacs, Kenneth Nyberg and Stéphane Van Damme (eds. ), Linnaeus, natural history and the circulation of knowledge, Oxford University Studies in the Enlightenment 2018:1 (Oxford: Voltaire Foundation, 2018). Published last January, this volume – with contributions by ten scholars from almost as many countries – examines the circulation of knowledge about nature in the long eighteenth century. As the back cover puts it, in the book we “argue for the need to re-centre Linnaean science and de-centre Linnaeus the man by exploring the ideas, practices and people connected to his taxonomic innovations”. (See below for the table of contents.) Apparently this is just what many people had been waiting for, because a few days ago I and my co-editors received word that the volume has already sold out of its (admittedly modest) first print run with a second printing now underway. 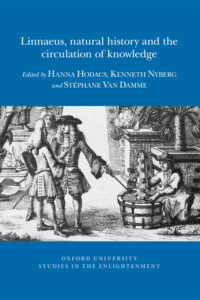 More information about Linnaeus, natural history and the circulation of knowledge is available on its page at the Voltaire Foundation’s website and in the blog post written by the volume editors at the time of the book’s release. Shortly after, both Dalarna University and the University of Gothenburg interviewed Hanna Hodacs and me, respectively, for online articles in Swedish on the aims and arguments of the volume. Finally, as a matter of historical record (as it were), I have also published blog posts here about the workshops in Stockholm in 2012 and Florence in 2014 where early versions of the contributions to the volume were presented and discussed. More than five years from first drafts to finished book is a very long time, but in this case it was definitely worth the wait. Update 14 August 2018: If you want to order the book, the purchase link on the Voltaire Foundation page mentioned above does not work. Instead, go to this page at Liverpool University Press. Much of my research during the last few years has focused on the eighteenth century botanist and traveller Pehr Löfling, a student of Carl Linnaeus. I am not yet done with him, I think, but last week I submitted the final report on “Pehr Löfling and the globalization of knowledge, 1729–1756”, a project that ran from 2011 to 2014 and was funded by the Riksbankens Jubileumsfond. Below is the English version of the report’s summary of objectives and outcomes, followed by the list of publications resulting, directly or indirectly, from the project. Over the next month or two I will reorganise a now defunct Swedish-language research blog on Löfling into a permanent project archive with a variety of documentation and resources. While most of the information will be in Swedish, I plan to include a few pages of overviews on Löfling and the project in English, as well as an extensive list of references and links to related material in Swedish, Spanish and English. The overall objective of this project has been to use the life and travels of Swedish botanist Pehr Löfling (1729–1756), who worked in Spain and South America in the 1750s, to explore and analyse the early wave of knowledge globalisation that Linnaean botany represented. The research has focused on three encounters in the “life geography” of Löfling: between him as a young student and Linnaean taxonomy, between him as a Linnaean “apostle” and the world of Spanish science, and between him as a European (colonial) scientist and indigenous American populations. In essence, this basic premise has not changed as the project has run its course, although over time I have revised parts of the theoretical framework. In the application I used ideas about centre/periphery and the relationship between concepts like local, national and global to organise the contexts in which Löfling moved. While they were never meant to be applied uncritically, in view of recent discussions within the global history of science about the “circulation of knowledge” and “go-betweens” these notions grew increasingly problematic and have been gradually toned down. This shift aligns well with my own previous work on the global travels of Linnaeus’s students, where I have challenged what I call Linnaeus’s perspective on these journeys and argued that they should be understood in a broader context where there were many stakeholders with different motives. One of the main results of the project has been an example of this in practice as Löfling, during his time in Spain and South America, did not only try to lay the foundations for a future career by cementing his relationship with Linnaeus and other key figures in Sweden, but also actively worked to make himself known to internationally prominent botanists. Meanwhile, in Madrid he did everything he could to build trust and good relations with Spanish scientists and politicians, on whom he depended for the journey to Cumana and Guayana that might be decisive for his prospects as a naturalist. The second major finding concerns Löfling’s role in the process by which Linnaean natural history evolved from a national enterprise – albeit one with global roots, as it were – into an endeavour on a European and eventually global scale, often in the service of colonialism. Based on both primary and secondary sources I have been able to significantly deepen our understanding of the implications of a previously known simple fact: that Löfling was one of the first examples of this development. Before any other Linnaean traveller he took part in an actively ongoing colonisation operation, that of the Spanish empire in Cumana province. In the close examination of this aspect of his life and work, I have also been able to engage the discussion about the go-betweens and their role in the global circulation of knowledge, arguing that depending on circumstances European scientists like Löfling could also clearly assume such a role. The third and last main conclusion also relates to Löfling’s position as a quintessential middleman, situated as he was at the intersection of multiple traditions, cultures and identities in Madrid as well as New Andalusia. Analysing this position by the use of letters written to various types of recipients – family, friends, Linnaeus and other Swedish benefactors, Spanish botanists and officials – I have been able to show how Löfling’s identity was continually being renegotiated based on changing situation(s) and relations. In him, loyalties based on nationality, ethnicity and religious belief were often deeply connected to and entangled with his strong sense of what it meant to be a Linnaean botanist. Thus, qualities that he associated with ‘other’ (and competing) traditions of natural history he also ascribed, to some extent, to the Spanish as a nation; and in his mind this latter category was, in turn, closely associated with the inherent ‘otherness’ of their predominant religion, Roman Catholicism. In the course of the project new questions have arisen that point to the broader context of Löfling and his work. Firstly, it would be interesting to relate the study of Löfling in more detail to the other stakeholders in his journey and their varying motives, and to explore what this says about the relationship between science, colonialism and politics during the eighteenth century. Such issues have been touched upon within the project, but could be developed significantly based on both primary sources and an extensive literature in Spanish that is rarely cited in Swedish- or even English-language scholarship. Secondly, the work on Löfling has made me more aware of the little-known history of Spanish-Swedish relations from a colonial perspective. A study of the repeated Swedish efforts throughout much of the eighteenth century to acquire a colony from Spain in the Caribbean or on the South American coast could be a very interesting contribution to the globalisation of Swedish history. 1) Kenneth Nyberg, ”Forskare är också människor: Om global historia och forskarbiografiers värde,” in Henrik Alexandersson, Alexander Andreeff & Annika Bünz (eds. ), Med hjärta och hjärna: En vänbok till professor Elisabeth Arwill-Nordbladh (Göteborg: Institutionen för historiska studier, Göteborgs universitet, 2014), pp. 65–74; available online at https://kennethnyberg.org/forskare-ar-ocksa-manniskor/ (accessed 23 March 2015). 2) Kenneth Nyberg, ”Från Tolvfors till Orinoco: Pehr Löflings resa och den globala historien,” Historielärarnas förenings årsskrift 2015 (forthcoming, summer 2015), c. 10 pp. 3) Kenneth Nyberg & Manuel Lucena Giraldo, ”Lives of useful curiosity: The global legacy of Pehr Löfling in the long eighteenth century,” in Hanna Hodacs, Kenneth Nyberg & Stéphane Van Damme (eds. ), Empire of Nature: A global history of Linnaean science in the long eighteenth century (forthcoming, spring 2016), c. 25 pp. 4) Kenneth Nyberg, ”A world of distinctions: Pehr Löfling and the meaning of difference,” in Magdalena Naum & Fredrik Ekengren (eds. ), Encountering the ‘Other’: Ethnic diversity, culture and travel in early modern Sweden (forthcoming, spring 2016), c. 25 pp. 5) Kenneth Nyberg, ”Linnaeus’s apostles and the globalization of knowledge,” in Pat Manning (ed. ), Works of Nature (forthcoming, spring 2016), c. 22 pp. 6) Kenneth Nyberg, ”Anders Sparrman – konturer av en livshistoria,” in Gunnar Broberg, David Dunér & Roland Moberg (eds. ), Anders Sparrman: Linnean, världsresenär, fattigläkare (Uppsala: Svenska Linnésällskapet, 2012), pp. 13–34. 7) Kenneth Nyberg, [review of] ”Torkel Stålmarck, Ostindiefararen Carl Gustav Ekeberg 1716–1784, Acta Regiae Societatis Scientiarum et Litterarum Gothoburgensis, Humaniora 44 (Göteborg: Kungl. Vetenskaps- och Vitterhets-Samhället, 2012). 94 s.,” Sjuttonhundratal 2013, pp. 235–237. 8) Kenneth Nyberg, [review of] ”Gösta Kjellin och Johanna Enckell, Sissi-Jaakko. En klassresa i svenskt 1700-tal (Helsingfors: Schildts 2011). 176 s.,” Historisk tidskrift 2013:1, pp. 93–95. 10) Kenneth Nyberg, ”En linneansk forskarkarriär i ett globalt perspektiv: [Review of] Marie-Christine Skuncke, Carl Peter Thunberg – Botanist and Physician: Career-building across the oceans in the eighteenth century (Uppsala: Swedish Collegium for Advanced Study, 2014),” Respons 2014:6, pp. 62–64. 11) Kenneth Nyberg, ”En linneansk karriär [review of Marie-Christine Skuncke, Carl Peter Thunberg – Botanist and Physician: Career-building across the oceans in the eighteenth century (Uppsala: Swedish Collegium for Advanced Study, 2014)],” Svenska Linnésällskapets årsskrift 2014, pp. 161–163. 12) Hanna Hodacs, Kenneth Nyberg & Stéphane Van Damme, ”Introduction,” in Hodacs, Nyberg & Van Damme (eds. 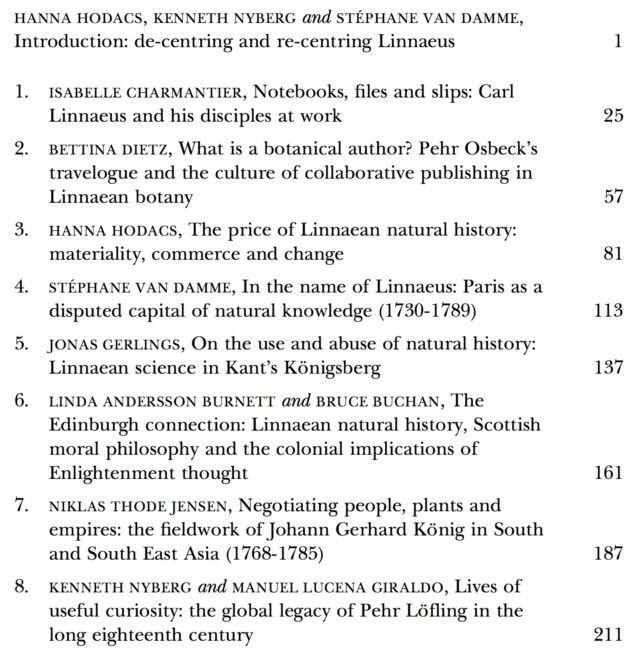 ), Empire of Nature: A global history of Linnaean science in the long eighteenth century (forthcoming, spring 2016), c. 30 pp. Some two years ago, Hanna Hodacs and I co-sponsored a workshop called “A Global History of Linnaean Science” at the Royal Swedish Academy of Sciences in Stockholm, where we were hosted by the Director of the Academy’s Center for History of Science, Karl Grandin. It was a small event, with eight presentations and a total of 22 participants, but we thought it a great success and decided we should try to publish the papers as a collected volume. One of the participants that day, Stéphane Van Damme, agreed to edit the collection together with us, and we began to plan for a second workshop more focused on discussing draft chapters than oral presentations. After a long time of preparation we finally reconvened last week, on 14 November, for an intense day of discussions at the European University Institute in Florence, Italy. Stéphane is now a Professor of History of Science at the Institute, which graciously provided all the local arrangements and facilities as well as lodging for those who attended. Karl Grandin and the Swedish Academy of Sciences once again generously supported us, this time by helping with the cost of travel for some of the participants flying in from various countries in Europe and elsewhere. 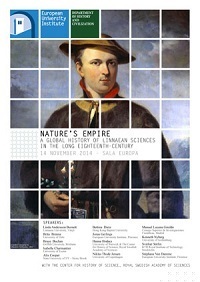 The full title of this second workshop was “Nature’s Empire: A Global History of Linnaean Science in the Long Eighteenth Century” and the programme including a list of contributors can be downloaded here (PDF, 643 Kb). This conference addresses a topic at the forefront of many discussions today, the global circulation of knowledge. Few eighteenth century figures can have contributed as much to the globalisation of natural history knowledge as the naturalist Carolus Linnaeus (1707–1778). The publication of Species Plantarum in 1753, Linnaeus’s global flora where he launched his new scientific nomenclature to an international audience, is often referred to as year zero in the history of modern botany. Published at a time that saw an escalation of contacts between different parts of the world, Linnaeus’s work promoted global communication and exploration of the species of the planet. The argument of this conference is that in order to understand this process we need to move beyond the individual intellectual contributions of Linnaeus to focus on processes that involved circulation and modification of knowledge. This […] includes discussions on early modern information storing technologies and the use of landscapes for pinning names to nature and establishing orders and systems. It also focuses on the creation of collective and individual identities through reading and corresponding, and the role of journeys, in and between landscapes, shaping knowledge gathering and the lives of knowledge gatherers. [The] conference aims also to offer a historiographical perspective on this process, including a discussion of pre-Linnaean natural history, and the legacy of Linnaean natural history in modern scholarship. Linnaeus’s interest in natural history was largely aimed at exploring resources at home in Sweden, or enriching domestic flora and fauna with exotic plants and animals. His taxonomy and nomenclature were of course to have more far ranging impacts than that, and as such [the book in preparation] will also offer a way of thinking of the connections between local and global and knowledge and power, and thereby contributing to current debates about the relationship between science and European expansion. Producing a book is often a protracted affair and much work clearly remains; while the workshop resolved some issues and enhanced our understanding of others, it also raised new questions that need to be answered before we are done. Still, I think we all felt that this one, long day of conversations about the global history of Linnaean science brought us quite a bit closer to our goal. The next step, for authors and editors alike, is as expected as it is familiar to all of us: Revise and resubmit. And that, of course, has always been what both scholarship and science is all about. First of all, the programming class was tremendously good and I learned a lot in those five days. For a complete beginner the pace was quite fast, but our instructor did an outstanding job of keeping all of his 14 students on board and constantly moving forward. In just a few days we went from being introduced to some basic concepts in programming to working on different coding projects in small teams, ranging from text extraction and manipulation to geocoding analysis and writing a text adventure game. Some times it was hard to keep up and I’m still very much the beginner, but it was really valuable just to spend so much time in the command line interface day after day and to gain familiarity with it. Perhaps this familiarity and being comfortable with working in the Terminal was the most important outcome of the Institute for me personally, since it gives me the confidence to move forward and continue to learn on my own now that the DHSI is over. On a more general level, the out-of-class sessions I attended throughout the week were about a variety of topics but, to me, a common theme became apparent as the days went by: a sense of “digital humanities reality check(s)”. The sessions may have been about trying to define who are digital humanists or not, about open access or graduate training, but to my mind they all seemed to return again and again to issues of finding a balance between idealism and pragmatism in promoting and implementing the digital humanities – whatever that is. And throughout all of these discussions, I couldn’t help but think that as the question of definitions is a case of “you’re damned if you do and you’re damned if you don’t”. In other words, while many would argue that the endless debates about “defining DH” are just a waste of time and energy it is hard to see how they can be avoided, since in order to know what we are doing we have to know what “it” is and what it means. It also seems clear to me that one of the main reasons for the great surge of digital humanities over the last few years has been exactly the fact that it is a very elastic, multifaceted term. It signifies many different things to different people, and when these come together it is inevitable that there will be intense and sometimes rather messy discussions about what it all means as these different groups try to figure out if and how they are a “we” or not. So, for instance, while to some the digital humanities is rather simply just what the term implies, more or less traditional humanities scholarship that happens to be carried out with digital methods and resources, to others DH is something much more radical: a movement aiming for comprehensive and fundamental transformation of humanities research and the academic world that it is a part of. Between these extremes there is a variety of intermediate positions and priorities within the “big tent” that the digital humanities, whether you like it or not, is today. Reflecting on this situation and the discussions taking place within it, I cannot help but draw a comparison to a completely different, but in some ways also remarkably similar, historical context: the Reformation in sixteenth century Europe. This may seem far fetched, but there is the same widespread – albeit not universal – sense of crisis for the existing order within a well-established institution (the church/academia) on the one hand, and the same lack of consensus on how swift, deep and wide-ranging the reforms to counter it should be on the other. Some within the system don’t see the need for any internal change at all since the main problem, to them, is an unappreciative outside world who must be made to value appropriately the work we are already doing. Others feel that in essence, the basic principles of the current order are right but they are being misapplied or abused, so that what we need are some fresh ideas on how to practice what we preach. Yet others, finally, think that the whole system is corrupted beyond repair, in urgent need of being reimagined and rebuilt from the ground up. Everyone, of course, are deeply convinced that their view is the right one, and the outcome is a clash of competing visions that can be both invigorating and frustrating to witness up close. My own position in all of this is firmly located somewhere in the middle, or perhaps even on the outskirts of the whole debate. To the question being raised in one of the DHSI sessions, “Are we all digital humanists now?”, I would reply that on the one hand it is completely obvious that the answer is yes, in the sense that all humanists work with digital materials and methods and will increasingly come to rely on such in years to come. On the other it is equally apparent that the answer is no, for reasons already suggested above: many academics in the humanities do not subscribe at all to the agenda of those who most fervently self-identify as digital humanists and who see DH as something much more than merely a new methodology. One of the reasons why DHSI is such an interesting environment is, in fact, that it draws together people ranging from one extreme of this spectrum to the other, which makes for lively and diverse exchanges of ideas. DHSI’s director, Ray Siemens, at one of the closing sessions of the 2014 Institute. Having said that, I thought there were in some of the discussions a tendency to make unnecessarily sharp distinctions between “us” (as in progressive, innovative digital humanists) and “them” (as in conservative, traditional academics); to reproduce such polarizing dichotomies of “we and they” is rarely a constructive way to move forward. It should also be remembered that the world of the digital humanities is not free from hierarchies or other forms of inequality; they just look different and are based on other criteria than in some other parts of academia. Perhaps this is, at least in some respects, more apparent to someone like me, in several ways something of an outsider looking in at the community of (self-identified) digital humanists. Generally speaking I see many intriguing opportunities and much potential worth exploring in digital sources and methods, but there are also many aspects of “traditional” scholarship that I think are important to preserve and/or to build on for the future. That makes me approach the more “radical” DH ideas and their proponents with an ambivalence that may best be characterized as a sceptical sense of sympathy. It also makes me think that we have many bridges to build in the years ahead, and that is ultimately what DHSI is all about. It was Ambrose of Milan who suggested that human redemption is effected because Satan, Death and Hell “swallowed” Christ, as a monstrous fish swallows a hook, so that in overcoming Christ, Death itself was overcome, caught, captured, rendered powerless by Christ’s indestructible life. In the same way, perhaps, the revivifying effect of historical inquiry, which to us seems like a service to the needs of the present, may in fact be the accomplishment of that redemption from misunderstanding, from partial knowledge, which the dead of the past demand. Rarely or never before have I seen the meaning of history being described quite like this. The whole piece, from the title onward, is permeated by Biblical and theological imagery and references that many “secular historians” would probably not feel entirely comfortable with, at least not in the context of discussing the purpose of their work. For me, however, it represents a thoughtful, inspiring and deeply human way of conceptualizing what it is historians do and why. And I cannot help thinking that by comparison, most of the conventional explanations of why history matters seem rather shallow and trivial. Over the weekend I attended a conference in Lund called “Encountering the ‘Other’ – Understanding Oneself: Colonialism, Ethnic Diversity and Everyday Life in Early Modern Sweden and New Sweden”. It opened in the afternoon of 8 November, when an accompanying exhibition was also inaugurated at the Lund University Library, and continued for the next two days. The conference and exhibition were organized on the occasion of the 375th anniversary of the shortlived Swedish colony of New Sweden in present-day New Jersey, Delaware and Pennsylvania, with the aim to situate this enterprise in a global context of cultural encounters, colonialism and everyday material practices. The two days of individual sessions, some of them co-organized with a parallel conference at the University of Delaware, covered a very broad and diverse range of aspects related to these general themes. It was an intense schedule, full of interesting presentations and discussions, and when we finally reached the end of the event (and of the weekend) I think many were in the state one should be in after a good conference: exhausted but reinvigorated with new ideas and questions. I had the privilege of delivering the opening address for the conference and exhibition. What follows after the link below is the full text of the keynote, which is also available here as a PDF (11 pp./96 Kb). History is shaped by the tools available for making it: cuneiform tablets tallying sheep or barley are less flexible as texts — they carry more limited forms of information, in smaller quantities, and in harder to reproduce form — than 17th century letters or printed books. By the same token, digital communication can do things that early modern technologies of writing and print can’t (for instance, web packets are at considerably less risk of falling into rivers during winter storms). History changes, and is also changed by, the technologies used to record it. At the same time, however, history isn’t about those tools — it’s about people.